Has anyone else noticed how hot it is this week? No? It’s just me? OK…sure. Anywho, I wanted to get out of the house and do something with L in the morning, but there’s really not a lot of places to take here where we can cool off. My idea was the fountain at Arcadia Creek Festival Place, but when we got down there, it wasn’t on. I saw a post near the fountain and wondered if that was a switch to turn it on. It was, but when I pushed the button, nothing happened. The fountain never turned on, so I was out of luck. We couldn’t splash in the water, but I figured we could pick up lunch while downtown. My first plan was to finally check out K Street Eatery on the Kalamazoo, but I believe that little take out window may have closed. There is still signage in the window and I was there during a time they were supposed to be open, but the place was dark. Luckily, I passed a place just down the street last Saturday on our way to the Epic Theatre. Again, I had to park down the street from my destination on the mall, so again, I walked right passed it on my way back to my car. 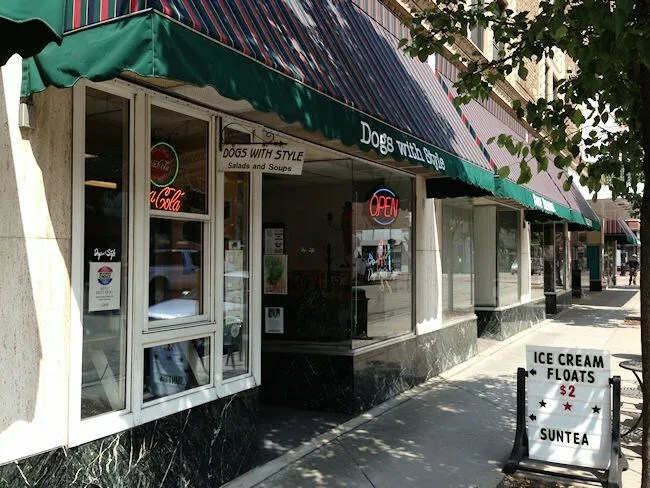 Dogs With Style is a very small hot dog shop on South Burdick just south of the Kalamazoo Mall in the State Theater building. As I’ve mentioned in the past, I don’t like hot dogs. I know, I’ll say it again, I’m weird. Who doesn’t like hot dogs? There really isn’t much on the menu other than dogs. If I liked hot dogs, I really think I’d love this place. They have Chicago Dogs, Coney Dogs, Chili dogs (different from the Coney dog…real chili, not the chili sauce), chili cheese dogs, cheese dogs, and a regular dog with ketchup, mustard, relish, and onion. Almost all of that sounds incredible to me…except the dog part….damn I’m weird. I know what you’re thinking. “So what DID you eat?” Well, let me tell you. I had the Chicago Style Italian beef and an order of Chili-Cheese fries. The sandwich and fries cost me exactly seven bucks and the restaurant is cash only. Fortunately, I had a ten in my pocket. I didn’t even think of that before walking in, but I looked around as my meal was being made and didn’t see a credit card machine. I asked for my meal to be wrapped up in foil to go because I had L with me and there was really nothing on the menu for her to eat. On top of that, there are no tables inside Dogs With Style. There is a bar that runs along the back wall with stools so you can eat in, but that’s not really conducive for L and I….plus, I was still on the hunt for water for us to splash in. 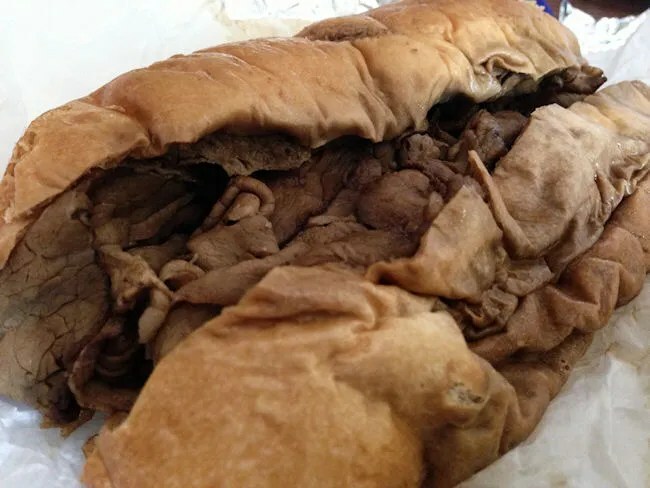 After a quick stop at Wendy’s to pick up lunch for L and J, I got home and unwrapped a deliciously soaked Italian beef bun with thinly sliced beef piled on. I had to go with a pretty plain sandwich because the peppers and onions come pre-mixed, so I couldn’t just add peppers, I would have had to add both peppers and onions…and I’m not an onion fan. The beef was nice and tender even if it is a packaged sliced beef. It had a pretty beefy taste to it instead of the typical Italian seasoning flavor. The bun was a hearty hoagie roll that soaked up a lot of the gravy yet didn’t fall apart upon the commencement of eating. 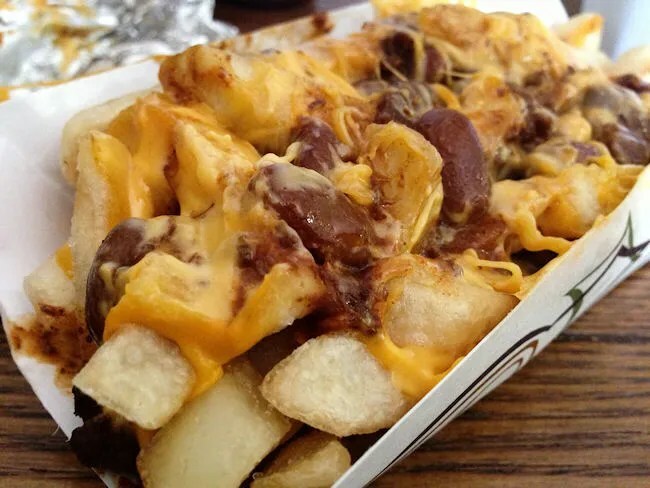 The chili-cheese fries are restaurant style fries topped with sprinkle cheddar cheese the melts from the leftover heat of the fries and a chunky, beany chili. I would have loved if these fries had been topped with the Coney sauce instead of the chili, but they were still pretty yummy with the chili. 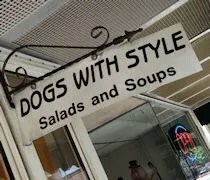 Dogs With Style is a great little downtown joint that’s perfect for a quick lunch. I’m not a hot dog guy which doesn’t make me an expert on hot dog joints, but I enjoyed what I had. Love their fries when they come straight out. Also, he puts both the shredded and liquid cheeses on the cheese dogs if you ask for it. Wish the hours were a bit longer though. If you’re going to a Hot Dog place, you should at least say which brand of HD they’re serving up. Koegels?